At this time of year the kitchen garden is looking a bit mean. Thinking back to the old walled gardens that had an estate to feed and the house to supply, it is amazing that they could provide enough food all year round when the garden yields the bulk of its crops over just six or seven months. There are two winter vegetables that did well for us last season, leeks and Jerusalem artichokes, which have the distinct advantage of standing for months and providing a crop over a long period of time. Both are left in the ground and dug when needed. At this time of year, though, the leeks are about to throw up a flower spike and the quality will rapidly decline. The Jerusalem artichokes are just starting to develop some roots and, although they are still rock hard and great to eat, they really need to be harvested and some replanted for next winter’s crop. It seemed like an ideal time to make some soup from these two great winter staples. Jerusalem artichokes are often used to make soup, but until recently we had never tasted it. We donated some artichokes a while back to one of our friends, who turned it into a big batch of soup. It was very good indeed. I cannot recall exactly what went into it, but artichoke was the primary ingredient. This recipe is a little different, with the addition of plenty of leeks, but it still has much of the smooth texture and distinct flavour of the artichokes. There is nothing quite like homemade soup from fresh ingredients. Just the smell of the vegetables cooking away tells you that it is packed full of goodness and flavour. The secret to good soup is the stock base, whether this comprises some prepared stock or the addition of the usual stock vegetables – carrots, onions or leeks, and celery. In my view, it also makes a big difference if the vegetables are properly sweated down before the liquid is added. Cooking at this higher temperature, although without colouring, really helps with the flavours. The process takes a little time but I think the results are worth the effort. I happened to have to hand some chard ribs after using the greens from some large leaves the previous day. I do not imagine it would make any real difference to leave them out, but the great thing about soups is that one can adapt to whatever is available from the garden. Chard is, though, another great vegetable with long harvest periods, and is in great condition now, as the over wintered plants start to grow away in the spring. One could easily make this recipe just with the vegetables and water. However, I also had to hand some good homemade chicken stock, so added about 600ml of stock and topped up with water. Cream is another optional ingredient. 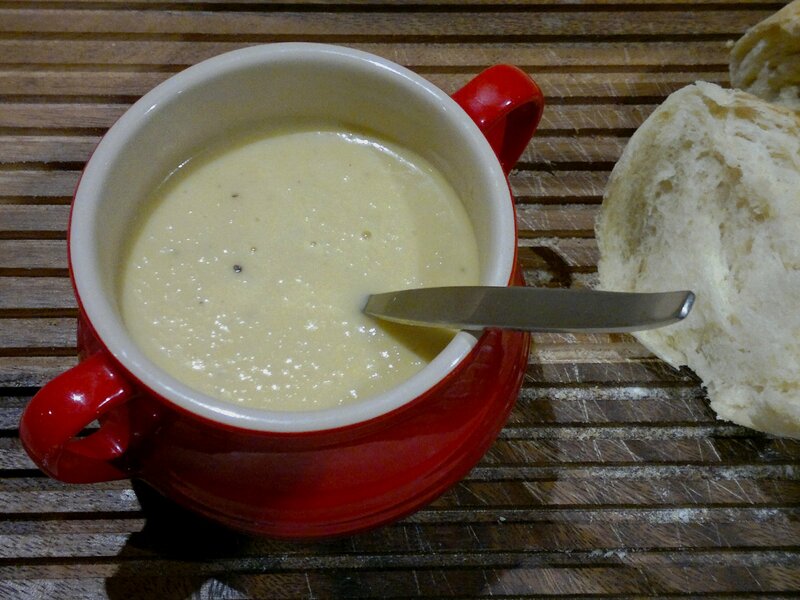 With smooth soups like this it often helps the texture, not to mention flavour, but it can be omitted if desired. Peel and dice the carrot. Add a splash of olive oil and a knob of butter to a large pan and, over a medium heat, sauté the carrot. Meanwhile, continue to prepare the other vegetables and add to the pan. First, slice the celery and the chard ribs, if using. Then quarter the leeks lengthways and wash carefully to remove any grit. Roughly chop and add to the pan. 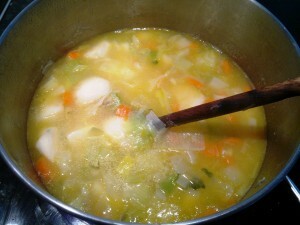 Continue cooking the vegetables; they need at least 30 minutes in total and should be nicely softened but not coloured. While they continue to cook, prepare the artichokes. Wash and peel them, adding immediately to a bowl of water to prevent discolouration. Roughly chop and add to the other vegetables, cooking for a further 10 minutes or so, before adding enough water or stock to cover the vegetables. Simmer gently for about 60 minutes, or until the artichokes are tender. Blend until smooth, then add the cream, if using, and season to taste with salt and black pepper. Add a little more liquid if the soup is too thick. This entry was posted in Garden diary, Recipes and tagged Jerusalem artichoke, leeks on April 9, 2014 by JV.